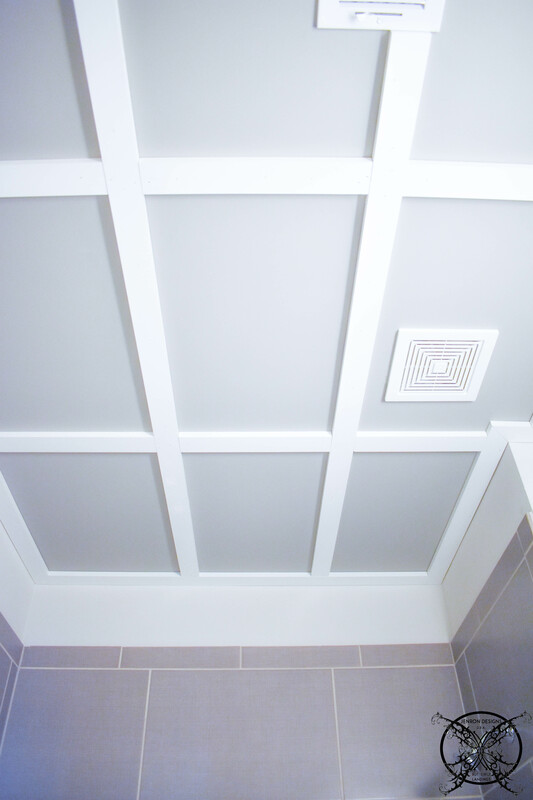 Welcome to week 3 of the $100 Room Challenge, this week our DIY is adding a coffered ceiling to our bathroom. 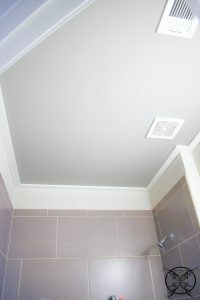 Okay so this week we are installing a faux coffered ceiling to our bathroom to add some visual interest to the ceiling. Since this room has 9 foot ceilings, we are not concerned about the feeling of making the space feel small, in fact we plan to paint the ceiling a darker shade of gray. 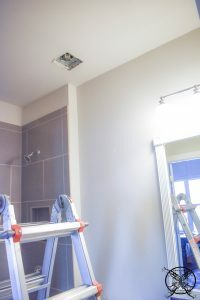 The first part, as with any project is prepping the room for painting by removing the vents, wall art, shower curtain and any other extraneous items that would be in the way. 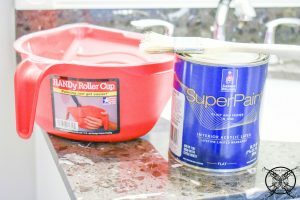 Next, I want to talk a little about paint color, we will be using an existing paint that we already had on hand left, over from when our house was built. The reason this will work so easily is due to a simple rule of two shades lighter or darker. If you are ever unsure of matching colors for a ceiling or an accent wall for a room; the rule of two shades lighter or dark will always work. 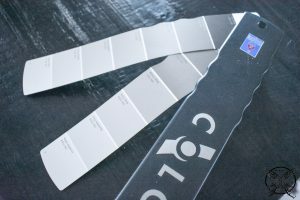 If you pick a single color card and go up or down two shades on the card your will always be safe in your color tone choices. This is also great for exteriors when picking trim colors to a base paint, to avoid horrible color pairings. This is how I know our left over paints will work perfectly, since I paired the entire house, including the exterior colors when building. So now I have many colors to choose from at a moments notice. Also, another trick is to aways keep white and black paint on hand, and you can darken or lighten any paint you already have on hand just by adding a spoonful of white or black to your decanted paint. However, a good tip is to keep measurements, just like baking, so you can replicate the color if needed, example 1 cup base paint to 1/2 white paint. *Please note that I was compensated for this post. This post contains affiliate links for your convenience. These involve no extra cost to you, but may result in me receiving a small commission should you decide to purchase after clicking on my links – for which I am very grateful! You can view my full advertising disclosure here. The painting will go super fast with my supplies that I had left over from my fall ORC project, from my friends at HANDy Paint cups, another one of my must have’s on any painting project. These cups are super handy when climbing a ladder and working in tight spaces. Plus, since the cups are completely reusable, the only thing you would need to purchase is a new paint liner, which is super affordable and will save you money over the long haul. Once we got the bulk of the ceiling painted and dried, we will install the the trim to create the coffers. For that reason we are not trimming out completely. If you followed my fall ORC challenge, you may remember I mentioned that this will save you time and paint. 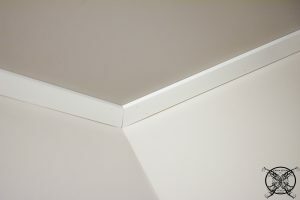 Also this keeps you from seeing dark paint between the trim and the ceiling if your walls bows. Which we will caulk, since I have OCD issues anyways. 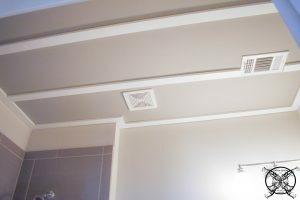 The next step was adding the basic white primed wood trim to create a cased frame around the ceiling. 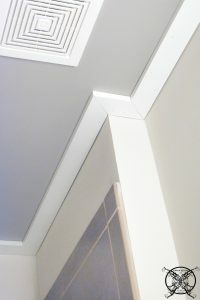 Since this room had several odd angles Ron used our miter box and bevel to cut the proper angles. Then using a nail gun with fine brads, he attached the boards to the ceiling. As you can see there will be a little bit of gapping that will need to be caulked and painted with our trim paint, which we bought in bulk for our last two projects of wainscot, and board and batten. 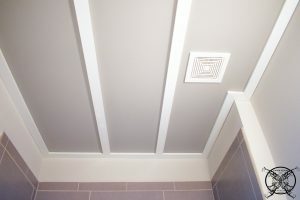 To make the grid of coffers, we opted to run them length wise across the bathroom in thirds first, which unfortunately hit right in the middle of the supply vent, go figure. As with any good project, these things happen and you just have to make the best possible decision. 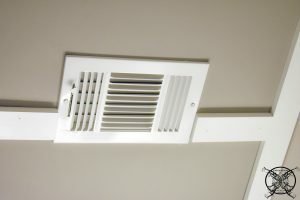 So in order to keep the coffers square, I opted to have the trim break on either side of the vent. While it is not ideal, I do not think that this looks horrible. In fact, I have actually seen worse on new construction homes done by “the pros”, so I am not going to lose any sleep over this decision, LOL. Once we got the horizontal long pieces installed we added the the grid work, or the frame. 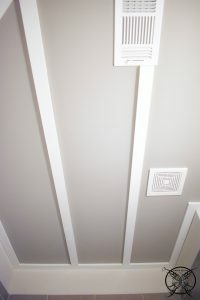 The reason we chose to do the long strips first was to make certain that we got them plumb, or straight in the room, even though no walls are ever straight. Also, you will want to do this from the main entry of your room. Since this room had two entrances, from two different directions, I picked the common entry point since this bathroom also doubles as a powder room from the downstairs living area. You are more likely to notice a visual slant from this direction. As we added each of the grids into the room, it created the faux version of a coffer, a smaller version of what we have in our great room. 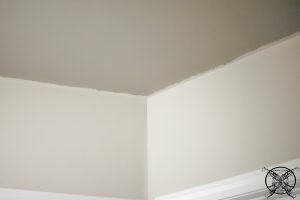 The two tone coloration of paint adds a nice richness to the ceiling as well. So for no additional money, just a little extra time, effort and energy, we were able to upgrade this project with a few supplies we already owned. The final step will be to caulk around the seems and fill the nails holes, which we have plenty of half used white caulk tubes around here that we need to use up. LOL! Do you guys ever do that? Just buy new every time you do a project and end up with a bunch of half used tubes that will eventually dry up and get tossed if you don’t use them? Well not this time, we are using everyone one of them and I am hoping we don’t need to buy and additional that hits my budget….LOL! WEEK 4- Chinoiserie Bird Stencil DIY, Revisit Mirror Paint Color-Possible Grey? Good read, I’m going to spend a little more time trying to learning about this type design subject. Hello I was just wanting to tell you how great this DIY is, and that I learned a lot. Thanks! Such a nice way to visual interest into room. You are doing a such nice design work on this competition. Ooohhh That looks awesome! I so totally want to do this now somehwere in my home! I Love it! What an amazing tutorial!!! It looks so good!!! Oh gosh I really, really like this a whole bunch. What a big difference this project has made in the your bathroom. I am so surprise and the reasonable pricing of it too! Wow what a difference! Love how this turned out! 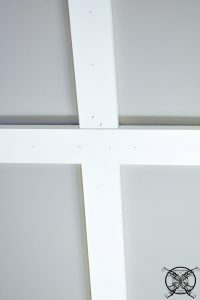 Wow this ceiling is really nice, and looks fantastic I can say I am inspired. This is really looking great for such a small investment. Hey there, it has been a while but I wanted to leave you note to say how great this project is and I am looking forward to the reveal. I am surprised at what a difference this really made in your room, and for so little money too. Lexington, that is the nicest thing I have heard all day, thank you so much! I am really excited to see everyone’s room makeovers this season and all the creativity in our community. These details really add dimension and interest to the ceiling. I love following what you do. 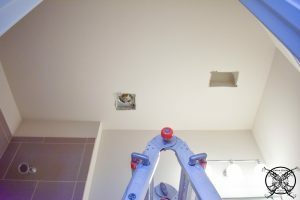 Wow, your ceiling looks amazing! 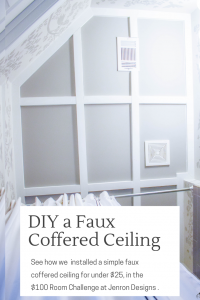 This is such a classy DIY project and makes a huge impact. So beautiful! You are totally the one that I first saw about this challenge which inspired me to participate. 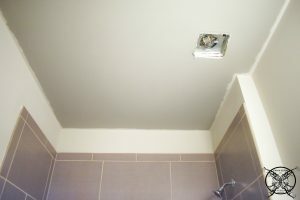 I can’t believe this ceiling is such a low cost! That looks amazing. I can’t wait to see the final room! I love the ceiling! It looks great and adds so much character to the room. 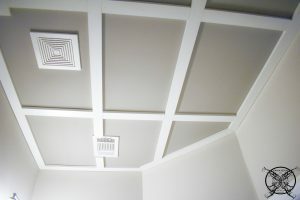 I always shy away from doing ceilings because it just sounds like it is uncomfortable to be working from that angle. so I think you are brave for tackling this! The difference is beautiful!! I need to create something like this for my bathroom also!! And it is in my price range! Yeah we had a few like that too, my husband usually puts a deck screw in the end and twists it down into the tub. This is trick we picked up around the construction sites when building various homes. I am actually surprised at how well it works, better than the provided caps, lol. Just went through out tubes of all assortments and had to toss many half-used, dried-up ones. Seems like every time we go to the home improvement store, I am throwing more caulk into the cart. Great tutorial and tips. It looks so much better! Amazing how details like this one can change a room! It looks gorgeous that ceiling! What a great project! I would never have thought to do this, and it turned out great. Beautiful and a great investment to your home. Wow this is really amazing! At first I thought I was looking at a wall from your Instagram picture yesterday, but now I can see it is ceiling which is even cooler. Jen I absolutely love this for a smaller bathroom it makes the space feel larger and really adds a nice focal point, so excited to the stencil next week!